One of Steven Universe’s biggest strengths is its resistance to centralization. Everything revolves around Steven, to an extent, but the show also takes great pains to keep a number of plots and subplots running, ranging from the very big (the Gems fending off Home World) to the slightly smaller in scope but still mythologically important (Steven’s efforts to reverse corruption) to the individual problems of Gems (Amethyst’s insecurity) and humans (Lars and Sadie’s relationship). Any of these can pop up at any time and take over whatever else is happening, but increasingly, the show has tried to pack several of these threads into a single episode. In these cases, it’s probably best to swing for the fences—which is exactly what storyboard team Colin Howard, Jeff Liu, and guest animator Takafumi Hori (in the first collaboration between Steven Universe and Studio Trigger) do in “Mindful Education,” which is a fusion episode, a Garnet episode, a Steven and Connie episode, and a musical episode all at once. Thankfully, Garnet steps in to help Connie (and Steven, sort of) work out their problems and reach a more harmonious fusion. It’s been a while since there was a strong Garnet episode, and while “Mindful Education” is still more of a Stevonnie episode (more on that later), there’s a whole lot of Garnet. From her “fusion sign” (it has one side for Steven and Connie and one for Stevonnie) to her adoption of Steven’s line, “Hold the phone. Now give the phone to me,” Garnet is in full-on sage mode, culminating in the bulk of this episode: “Here Comes A Thought,” a song written by Rebecca Sugar depicting Garnet and Stevonnie’s guided meditation process in a shared fusion mind space, with assists from all four component Gems and people. Steven Universe has been somewhat stingy doling out Estelle’s singing voice, and while there are surely good reasons for that, this episode is a great case for doing more. Garnet is calm and in control here, laying out another part of her fusion philosophy—fusion is a representation of the bond between two people (or Gems), and when one of the participants is out of sync, both parties need to honestly acknowledge the problem. And though Estelle is great, she’s upstaged by the real MVP of the song, and the episode: AJ Michalka, who finally gets to sing as Stevonnie. She does a fantastic job, capturing the soft anxiety of Connie’s guilt and channeling both Grace Rolek and Zach Callison as well, or better, than Natasha Lyonne did with Smoky Quartz. Stevonnie has really come into their own as a character in these past few episodes—defined, I think, by both a stronger sense of determination than either Steven or Connie, and an ability to take a more passive, calm form of joy in life than the hyper-energetic Steven—and their declaration “I’m here” is a lovely payoff to that work. The animation of “Here Comes A Thought” (which I would imagine is also the location of the guest work from Hori) is similarly lovely, depicting each negative thought or emotion as a gleaming white butterfly swarming in a vortex, threatening to overwhelm each singer until they’re able to acknowledge their emotions (with some help from the people around them). It all concludes with the lovely image of Steven, Connie, Ruby, and Sapphire all sprawled out in Garnet’s mind palace (or fusion equivalent). And the lesson Garnet attempts to impart in this episode, at that Steven tries to internalize at its conclusion, is quite powerful: It’s okay to experience negative emotions. Children’s entertainment often thrives on the illusion that relentless positivity is not only a plausible way to live one’s life, but a desirable one. This is, to put it lightly, a devastatingly bad idea, both for the reasons Garnet and Connie articulate—that for a given individual, balance and truth in relationships can only come from honesty about one’s feelings—and because this focus on individual sunniness (which is pretty frequently parroted by pop culture and people who claim to know how people should live there lives, and is even a part of Steven Universe’s DNA) can lead to an inordinate emphasis on personal responsibility for bad things that happen to you when they’re often caused by factors outside of your control. In Steven’s case that means acknowledging his guilt over letting down Bismuth, Jasper, and Eyeball. (“It feels so bad,” he protests, falling off the ruins with Connie after they unfuse.) In a broader context, that need to acknowledge negativity and accept it as a part of your emotional landscape might apply to something like dealing with poverty and other forms of institutional oppression. Thinking life has to be great all the time, and that that’s dependent on your “control” of your emotions (as Steven does, originally), can lead to a simultaneous spiral of depression and walls trying to keep out the truth. Everything is not awesome, Connie tells Steven as they fall, and that has to be okay—because it’s how life is. You have to feel your emotions, even when they aren’t the ones you want. The alternative is monstrous. I have one major problem with “Mindful Education,” and it’s this: For all that it originally looks like an episode exploring the fallout from Connie’s accidental beatdown, it ends up becoming a Steven episode. There’s nothing wrong with an episode of Steven Universe being about Steven, obviously. And Steven definitely does need to deal with these emotions, particularly as they relate to Rose shattering Pink Diamond—the end of season three was basically BoJack-level depressing for him, even if there wasn’t much he could do about any of the individual situations. But it feels a bit cheap to give Connie this problem—the first-ever exploration of the human ramifications of her involvement with the Gem world that doesn’t involve her parents—and then use as a way to demonstrate that Steven is still processing his feelings. The charitable reading here is that Connie just got over her problem really quickly, because she’s a much more practical person than Steven. (And also we can’t really follow her to school unless Steven comes too.) That’s fine as far as it goes, but I hope we get a bit more about what Connie’s going through in addition to the requisite episodes where Steven works through his issues. One thought about how to do that: Fusion, it turns out, is a pretty great way to show events Steven wasn’t physically present for. That tactic (along with the attendant fusion mind palace) is something I hope the show does a bit more frequently as Steven starts fusing with Gems. (Maybe that’ll be how he finally sees what happened with Rose and Pink Diamond?) 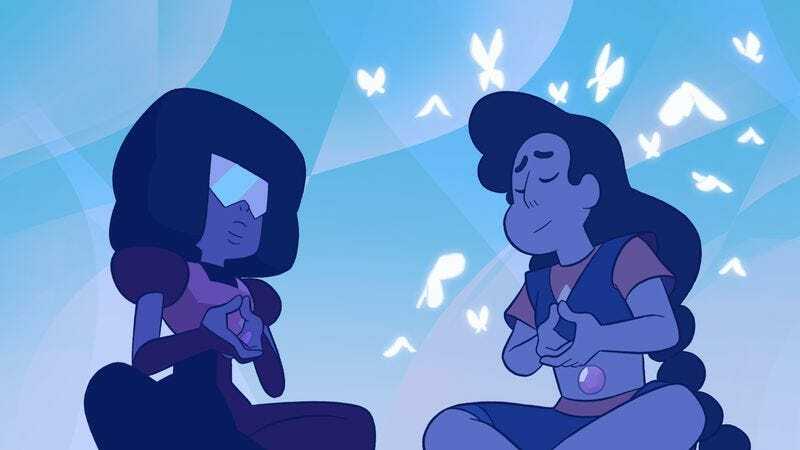 So in addition to delivering a great song, some excellent visuals, and a next-level vocal performance by AJ Michalka, “Mindful Education” might have introduced an exciting way for Steven Universe to bend one of its most fundamental rules. I don’t know. It’s just a thought. I’ve been thinking a lot lately about what you might call a healthy emphasis on negativity (with attendant clear-sightedness about what relentless optimism does to people), so the message of this episode is rather timely for me. If you’re interested in the topic, I highly recommend checking out, among other books, Lauren Berlant’s Cruel Optimism and J. Halberstam’s The Queer Art Of Failure. If Connie trains Jeff, does that make Pearl Jeff’s grand-trainer? Stevonnie’s floating powers are, of course, basically Yoshi jumps.